360 degrees around India in 360 days! Q. What is India 360? A. Let’s start with who we are. We are Hari and Priya, a couple from Mumbai. India 360 was a tour around India that we undertook between April 2017 and May 2018. 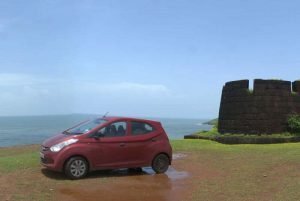 It was a trip where we travelled 360 degrees around India in 360 days or to put it simply, all around India in a year. We planned the trip on our own and did not use any travel agents. Along with this blog, we maintain photos, videos and descriptions of all the days on our Facebook page India 360. Some of our best photos are also curated on our Instagram channel india360d. The blog, Facebook page and Instagram channel are still being fed with content as we have now returned from the trip and have started sharing the stories gradually, part by part every week. Q. Why did you do India 360? We were born in India. We are proud to be Indians. We have spent all our life, i.e. 30+ years in this beautiful, vast country. Yet, we knew very little about it. So we wanted to see the whole country with our own eyes. Plus, taking an all-India trip had been Priya’s dream for over a decade. For a decade before our trip, both of us had healthy professional lives. Between the two of us, we had saved enough money for a trip of our dreams. 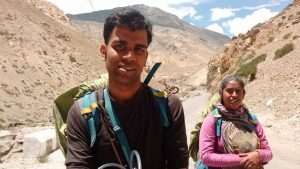 We meticulously took stock of our savings and found that the trip would hardly put a dent on our combined savings even if we were to travel for a year with no earning work on the side. So we took the plunge. Doing India 360 has been the richest experience in our lives and has been money and time extremely well spent. Q. How much did India 360 cost? We have recorded every monetary transaction that happened every day in India 360. The total cost for the entire year for both of us put together stands at around ₹ 5.5 lakhs (550 thousand as westerners call it). This includes food, lodging and travel everyday. We also had some luxurious indulgences along the way, such as a piece of Mysore woodwork art and a 3-day full-body spa at Kottakkal in Kerala. But overall, we were frugal, ate local food and stayed in no-frills lodges. At places where we had friends and relatives, we stayed with them. We were happy to buy them small gifts as a token of appreciation. Q. Did the trip have any theme? No, the trip was totally void of themes. The goal was broad — explore as much of India as we could in one year. We weren’t partial to only Himalayas or only hill stations or only beach cities or only pilgrimages or only archaeological sites. One day we would be on a peaceful island or in a jungle with wildlife, but the next day, we’d be in vibrant and lively city. We went where our heart — and TripAdvisor — told us to go. We had four guidelines though. The season determined which states we’d travel to during a particular time of the year. In each state, we were to stick to its most important national highway, using it as our lodestone. We diverged from the highway to explore the interior, but always rejoined it to start the next segment. No road or location was to be repeated. We avoided driving on the same stretch of the highway twice. We avoided visiting the same town / city twice. We succeeded 90% of the time, thus making sure that we were somewhere unique 90% of the time. Every state we went to was to be covered as deeply as possible, covering at least 60 – 70% of the ground area of that state. We would not just go to the touristy cities and towns, but also to the remote villages and towns with surprising wonders, but not sufficiently documented. If it was not possible to cover a state due to season or time constraints, then we dropped that state, leaving it for some other trip. Q. So, did you cover all the states and regions of India? A. Not even close. India is a vast country and even an entire lifetime is not enough to cover each corner of the country, let alone something as fractional as one year. We did not cover 12 provinces in India, a province being a state or a union territory. Technically, we ‘touched’ each state and union territory in India, barring Andaman & Lakshadweep. Some of them during transit on our road and rail trips. But we did not perform any sight-seeing trips in 9 of the states. We went nowhere near Andaman & Nicobar Islands or Lakshadweep. We did not stay for even a single night in Punjab, Haryana, Rajasthan, Uttar Pradesh, Bihar, Jharkhand, Madhya Pradesh or Dadra & Nagar Haveli. We saw these states from a window as our bus, train, car and motorbike trips took us through them. The maximum interaction we had with these states was to have tea or snacks at railway platforms or bus stops. We did stay overnight in two other states, Chhatisgarh and Odisha. But we used them as transits and did not do any major sight-seeing trips in either. Q. How did you decide your itinerary? We decided upon a broad itinerary based on seasons in India and the major national highways in each state. Indian summers are harsh. The only pleasant places during that season are in the lofty altitudes of the Himalayas. So the summer of 2017 (April, May, June) was allocated to the north Indian Himalayas: Uttarakhand, Jammu & Kashmir and Himachal Pradesh. The summer of 2018 (March, April, May) went to the north-east Himalayan region (Sikkim, Arunachal Pradesh, Nagaland, Manipur, Mizoram, Tripura and Meghalaya). Because the gateways to the north-eastern states were only through West Bengal and Assam, those two states would also form part of the plan in the summer of 2018. In fact, we reasoned that if we started as early as February during spring, we could ride out the warmer areas of Maharashtra, Chhatisgarh, Odisha and West Bengal and be inside the cooler reaches of north-east Himalayas by the time summer started. June to September is the magical time when it rains every day and the country turns into a green heaven. We could have travelled to any state, witnessing the monsoon magic. But nowhere does it get more beautiful that close to our home, Mumbai. In fact, the entire west coast of India, washed in 2500 mm of rain on average, sees the best of the Indian monsoon. So we kept it within the west coast for the monsoon, travelling through Maharashtra, Goa and Karnataka. That left just four months of milder weather and winter, i.e. October to January. Here were our options in this milder weather: all of south India, a combination of Punjab, Haryana, Rajasthan and Gujarat, a combination of UP, Bihar and Jharkhand or a combination of MP, Chattisgarh and Odisha. But we reasoned that during September, after having completed the west coast trip, we would already have reached the southern state of Karnataka. So it made sense to complete all of south India, rather than head back north. We axed plans for north and central India for some other trip. Q. Did you travel continuously or did you travel in phases? We travelled in phases. We took breaks at home in Mumbai between some of those phases. Here is what our final execution looked like. Phase 1: April 2017 – June 2017: Delhi, Uttarakhand, Jammu & Kashmir, Himachal Pradesh, Chandigarh. In these regions, we either took public transport in the form of trains, buses or shared SUVs or had to hitch a ride with locals or other tourists if they were headed to the same town as we were. In Ladakh, we hired a Bajaj Avenger 220cc motorbike. Phase 2: June 2017 – September 2017: Maharashtra and Goa. We used our car to carry out this phase of the trip. Phase 3: September 2017 – December 2017: Karnataka, Kerala, Tamil Nadu, Pondicherry, Andhra Pradesh, Telangana. This phase followed phase 2 immediately. So we continued with our car. Bonus phase: January 2018: Since we returned earlier than anticipated and had the entire month of January free, we explored the state of Gujarat and the union territory of Daman & Diu. We used our car for this phase too. Phase 4: February 2018 – May 2018: North east. In our most adventurous phase of the trip, we ventured on our 220cc Bajaj Avenger motorbike. We bought the second-hand motorbike just 10 days before our planned trip. Amazingly, we rode through central Maharashtra, Chhatisgarh, Odisha, West Bengal, Sikkim, Assam, Arunachal Pradesh, Nagaland, Manipur, Mizoram, Tripura and Meghalaya. On the final day of our trip, we loaded our motorbike on the train from Guwahati to Mumbai. We had already reserved the tickets for this train before leaving for the north-east trip. Q. Why only 1 year? India 360 meant that both of us would suspend our careers for an entire year. That meant no income for 12 months, while the expenses would be steady. In India, other than the metropolitan cities, Internet connection is not reliable enough to do serious work remotely. So Hari’s stint as a software freelancer was not feasible. Priya is a cost accountant and there aren’t enough on-the-go assignments available in that field. Plus, travel takes its toll. In the couple of hours that we spent indoors, the energy levels weren’t encouraging enough to push through a pile of work. A lifestyle of travel where one doesn’t earn, but inevitably spends everyday is not sustainable. Such a travel plan is best experienced as a time-bound experiment with a strict deadline. One year around India helped us see all the regions, all the seasons and all types of people. So a year was perfect to get a feel of India and use that as groundwork for a lifetime of travel around the country. After returning, our vision is to set for ourselves a model of business where we create an asset that will make money for us while we travel. Who knows! One day, we might be travelling around India as a lifestyle rather than as a year-long sabbatical. Our business will be earning money for us while we trek mountains, make travel friends, drive on highways and eat local delicacies. In fact, even when we are asleep. Q. Why not go through a tour operator? Tour operators are able to provide us with one aspect of travel: experience the joy of wonderful sights and activities. However they take away from you the other side. In fact, we would go as far as to say that they deprive you of that experience. Planning your travel, managing it and taking responsibility. And the ownership of pleasant and nasty surprises that happen from not having a set plan. We had no knowledge about the roads in the north-east. So we were hit with one daunting challenge after another as we rode through slush, crossed rivers on our motorbike, got stuck in waist-deep mud and so on. We were stuck when our bus from Srinagar to Leh broke down. But every time, we figured out a way to carry on. The fact that challenges were thrown at us and that we overcame them was in itself a joy. The joy of overcoming challenges is never a part of planned tours through operators. They make everything routine, predictable and ‘too safe’. Secondly, operators take you to places they want you to see on the dates they want to take you. They make you eat at restaurants they intend for you to and make you sleep in hotels they want to check you into. It takes away from the experiment of finding out places best suited for you. What if you don’t like crowded temples that much, but would like to linger a little bit more in the botanical garden. A tour operator will not allow you that flexibility. In our trip, we quickly left places we did not like and stayed for a couple of hours longer or even for an extra day at places we really loved. Q. How much luggage did you carry? It varied by phase, depending on what was available at our disposal. During the north trip through Delhi, Chandigarh and the Himalayas, both of us carried one 60-litre Quechua backpack each. We mostly wore the same clothes everyday. We took enough warm clothes with us to keep us warm in the Himalayas. The ideas was to load and unload portable luggage between trains, SUVs and buses or walk for extended periods of time with luggage strapped on. A typical backpacker’s life. During the trip across west and south of India, we had our car’s ample boot space at our disposal. So we carried our two 60-litre backpacks along with two more duffel bags. We shopped for new clothes in Goa and at Bangalore. We also got a piece of artwork at Mysore. Since we travelled in monsoon, we had rain coats, ponchos, umbrellas and even a 2-man Quechua tent in case we found it appealing to camp near a forest, on a Ghat or by the beach. States like Maharashtra have very little restrictions on camping and we used that to our advantage. For 5 days in Maharashtra, we used our bicycles. We carried one 60-litre backpack, one 30-litre backpack and a 2-man Quechua tent. The idea was to enjoy mountain road riding in the rain and to camp at night. We rode 400 kilometres over those 5 days, with one of the days clocking up nearly 100 km. The most adventure and challenging part was the 4th phase to the north-east when we rode our motorbike for 4 months (February – May). Along with the ride, the luggage was a challenge too. 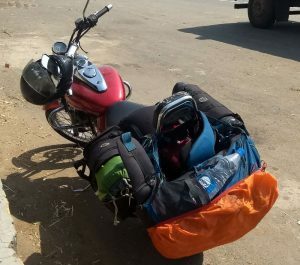 We started with a 60-litre backpack tied to the back rest of the bike, hanging just above the tail light. Then we used a saddle bag, that straddles over the seat of the bike with compartments hanging over the two sides. Our options were very limited and once again, we wore the same clothes everyday. We started with a laptop in our backpack. But the inclement weather in the north-east and the bumpy roads made us dump the laptop at my sister’s home in Assam and continue with an even lighter load. The 60-litre backpack was left behind and we only had the two-compartment saddle bag at our disposal. We got enough plastic covers to protect our only spare clothes from rain. We had to take warm clothes to protect us from snow in Sikkim and Arunachal. But we left them behind at my sister’s place for the rest of the north-east, where it doesn’t snow. Out of the 320 days on the road, more than 200 were spent in the above outfit. Q. Will you do India 360 again? Had you asked this question barely a week after completion, both of us would have said NO. We were drained, exhausted and travel sick. We longed to be home. It was great to be home, not having to wake up early, pack up, check out of a lodge and drive for long hours. Now that we are recharged, we have to say that doing India 360 over a year was simply experimental and even an extreme measure. A good way to roam around the country is to do month-long trips immersing yourself in different states and returning home before taking another trip. Travelling India should be more of lifestyle done over several years as a habit rather than a one-off sabbatical. The country is vast and there is too much to chew. We have seen plenty of India, but our future trips will dive into specific regions, learning more deeply about them. Rather than India 360 for a year, we will do trips like Madhya Pradesh 100% for 100 days or North West Karnataka for one month or Konkan beaches north-to-south for 15 days. And of course, we will cover Andaman and Lakshadweep eventually. Q. What will this blog cover? This blog will guide you on how to plan your own trips around India, whether the whole country at a time or in small trips. We are just getting started. But this blog will mushroom into a huge repository over time. We will present the following types of articles in this blog. Articles on certain states, districts and cities. E.g. Hip-hop Goa, Coorg district: the home of coffee, the evergreen Kolkata. Listicles. E.g. 10 unique museums in India or 10 enchanting cities by the Ganga river. Tips on travel and driving, e.g. How to pack for a month trip or How to drive your motorbike on snow. Specific historic features, e.g. exploring the Chalukya relics in Badami or reliving Assam’s Ahom dynasty of Shibsagar. Specific ethnic groups in India, .e.g one day in the life of the Ao tribe of Nagaland or what makes Jammu, Kashmir and Leh so different within the same state. Q. Everything looks interesting. Is there a place I can get updates when you publish new articles? Certainly. Please sign up for the latest articles by email in the form on the right. Thank you very much for your interest.